available in this CTTC Technician recruitment 2017. Candidates having Eligible qualifications can get application link from CTTC official website @ http://www.cttc.gov.in. Submit the application before closing date i.e. 20- 03- 2017 through post to the given address. Selection of CTTC Master Craftsman vacancies will be based on merit in written test/ Personal Interview. Other details like Age limit, selection process, Qualifications, Pay scale, Number of Vacancies of Central Tool Room & Training Center CTTC Technician Grade II recruitment exam 2017 are given below. Click here to see the official notification of CTTC Foreman Recruitment 2017. Last date to send offline application form: 20- 03- 2017. 1. Sr. Manager (Prod): 01 post. 2. Engineer (Prod): 01 post. 3. Engineer (Design): 01 post. 5. Master Craftsman: 03 posts. 6. Personal Asst. Gr. II: 01 post. 7. Administrative Asst. Gr. I: 01 post. 8. Technician Gr. I: 04 posts. 9. Technician Gr. II: 08 posts. Pay scale for Technician, Master Craftsman post is Rs.5200 to Rs. 20200/- with Grade pay Rs.1900 to Rs. 2400/-. Forman: Rs. 9300 to Rs. 34,800/- plus GP Rs. 4200/-. For other post pay scale details, see the CTTC official notification. Candidate must have qualified Degree/ Diploma in Mechanical/ Production Engineering, Tool & Die making from recognized University/ Institution. For post wise qualification (Essential, Desirable) details visit CTTC official Notification. Maximum Age limit of the candidate for all CTTC vacancies is 30 years (except for Sr manager (Prod)- 45 years) as on 20- March- 2017. Upper age relaxation for SC/ ST/ Internal candidates is 05 years and for OBC is 03 years. Selection for this CTTC recruitment will be based on their performance in written test/ Interview. 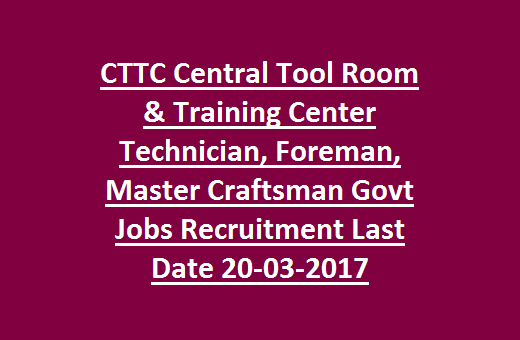 For Exam Date, Syllabus pattern and other details of CTTC Technician, Foreman recruitment 2017 see the official notification given below. 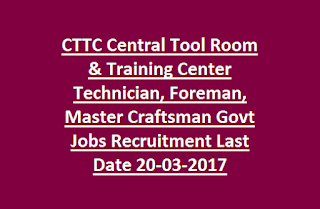 Interested candidates having essential qualifications may download the application form from Central Tool Room & Training Center Official website @http://www.cttc.gov.in. Fill the columns of offline application form with all details and send along with self attested copies of certificates to the Managing Director through post. Last date to receive offline application is on or before 20- March- 2017.